Sometimes it’s hard to make your stories sound exciting. In this guest blog, author Marianne Musgrove gives tips to make your next story more interesting. Read the two story openings below. Which do you think is more interesting? Why? Amal was nine years old. She loved animals and running. One day, she went to the zoo. A lion escaped and chased her down the path. Even though the same information is in both openings, B is worded in a more interesting way. The word ‘Run!’ makes you wonder what will happen next. Exercise: Take a look at one of your old stories, or write a new one. Choose an exciting part of the story and begin it there. Have you ever read a story where a character has an interesting problem that gets solved too easily? Eg. a character is stuck in a bog and a genie suddenly appears and rescues her. Think about this: what if the genie didn’t appear? What would your character do then? Be creative. Make things hard for your character and the story will be more interesting. Write a story where you and a friend are marooned on an island. A boat lands on the shore. How would you finish this story? The easy way would be to make the boat owners nice people who offer to give you a ride home. As an ending, it’s okay, but it’s not terribly exciting. What if the boat owners turn out to be pirates? Or what if they’re runaways with a secret? What if your friend is ill and needs urgent medical attention? Come up with your own way of making life hard for your characters and see what happens next. It’s one thing to say ‘Taylor is angry’ but another thing to show Taylor is angry. What do I mean by this? Here are two very short stories. Which one do you think is better? Why? Max’s teacher, Ms Anders, was very strict about students handing in their homework on time. Max hadn’t finished his. When Ms Anders walked into the classroom, Max was very scared. Max’s teacher, Ms Anders, was very strict about students handing in their homework on time. When Ms Anders walked into the classroom, Max’s hands began to sweat and his heart thudded. ‘Oh, why hadn’t he done his homework?’ he wondered, sinking into his chair. Reading about how a character feels in their body helps the reader feel the same thing. What happens in your body when you feel relieved? Do you sigh? Do your shoulders and head droop because they were tense just before? Does your heart slow down? Write a list of feelings, eg, relieved, angry, scared, sad. Under each feeling, write down what happens in your body. Next time you write a story, rather than saying, eg. ‘Jenna was angry’, describe how Jenna feels the anger in her body. 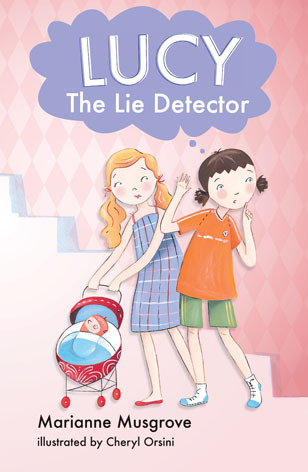 Marianne has a new book out: Lucy the Lie Detector. 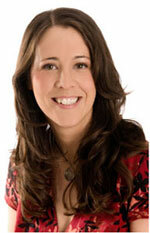 She has written many other books for children, including The Worry Tree (also with Random House Australia). Click here to visit Marianne’s website.